I easily earn over 500,000 frequent flyer points every year without stepping foot on a plane. That’s enough points for an overseas holiday each year in business class, plus a few domestic flights as well. I pay for all of my everyday spending with those high-earning credit cards, including an AMEX card that earns 1.5 points per dollar and a Visa or MasterCard that earns at least 0.75 ppd. (In a separate post, I’ve covered my strategy for maximising points for credit cards – read it here). wine – I’m a big fan. 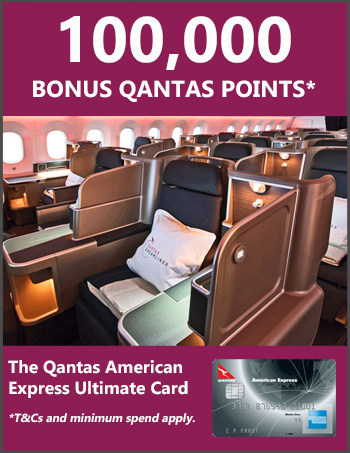 Qantas’ wine club, Epiqure, regularly offers 5,000 – 10,000 bonus points with a case of 12 bottles, delivered to your door. That’s on top of the 3 points per dollar you get for your purchase. The wine is not the cheapest but the quality is great and, for me, the extra points more than make up for the slightly higher price than I’d normally pay. Virgin also offers several wine shopping options. online shopping – Both Qantas and Virgin link to big online retailers where you can buy all your clothes, shoes, household products, cosmetics, electronics, music … the list goes on. There are regular bonuses where you can earn up to 10 points per dollar. I’ve covered how easy and lucrative this is in a separate post. hotel bookings – I mainly use the Qantas Hotels portal, which regularly has a promotion where you can earn up to 10 points per dollar for hotel bookings. The price is often the same or just a little higher than other online hotel booking sites. Virgin also offers hotel booking options. rent – my real estate agent allows me to pay rent via RentalRewards, earning 1.5 points per dollar with my Amex (for a fee, which I’m happy to pay). There are so many more ways you can earn points – including through grocery shopping and fuel, of course. Take a close look at the Qantas Frequent Flyer and Virgin Velocity websites to find all the options that suit you.